As David and I are starting to look at new homes, I can't help but be drawn to every little cottage that I see. Just like our 1952 ranch, there's something about the quaint, historic structure of a cottage that makes me feel at home. So it's no surprise that I absolutely fell head over heels for this cottage house tour over on Apartment Therapy. Let's check it out, shall we? The ceilings! The layered rugs! The bright funky wall in the backyard! I love it all. And I clearly cannot get enough of that amazing living room. Just beautiful! Are you listening, Atlanta? I need one of these available and at a reasonable price, mmmkay? To see (lots) more of this beautiful home, check out AT's article here. The dining nook is one of my all time favorites. I pinned it awhile ago and its so fun to see the rest of the awesome house. So much character! Love them all! 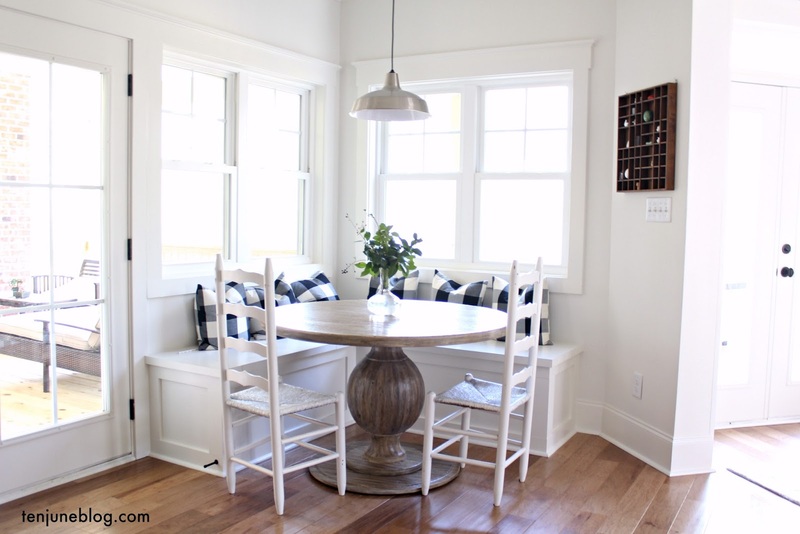 I really love that table in the kitchen nook with the pink legs. So pretty and unique! This home is so cozy. LOVE it all! When can I move in?! Congrats on being nominated at AT!!! I don't know if my eyes can handle any more awesomeness !!! I love every square inch of that cottage. Lots of sweet cottages and bungalows in the area you are looking!! I love the look and feel, some welcoming. love the bright pink wall and that breakfast nook! Ah! I love this house. The artwork and feel of the whole place is amazing. I also love the "yours sincerely" art. Congrats on being nominated!